Double stacking provides a truly enhanced, high definition view of the Sun’s surface details. It lowers the bandpass of the system from <0.7 Angstroms to <0.5 Angstroms. This will significantly make the surface features on the Sun “pop”! The Lunt LS152THa can be internally double-stacked at the time of purchase or anytime thereafter. The LS152THa does not need to be returned to the factory for double-stacking. You can purchase the LS100Tha single stack solar telescope. Subsequently, add the DSII internal double stack module to make it a double stack unit later. This will make it more affordable to purchase our best solar telescope and still have room for upgrades. Once you upgrade your Lunt LS100THa with the DSII LS152T internal double stack module, you will be able to see the finer details on the Sun that were not previously visible. Find NASA’s latest news and photo’s of the Sun. Lunt Solar Eclipse SUNglasses are manufactured in Germany and are 100% safe for direct viewing of the Sun and Solar Eclipses. We have been approved by NASA and the American Astronomical Society. Don’t let you, your family, your friends, and/or your local fundraising group be left in the dark during the next partial eclipses. Add an internal double-stacking module to a Lunt LS80THa solar telescope for a lowered bandpass of <0.5 Angstroms! The LS80THa DSII includes a pressure tuner for true Doppler tuning. Add the DSII to a new LS80THa at the time of order, or add it to an LS80THa you already own, no trip back to the factory required! 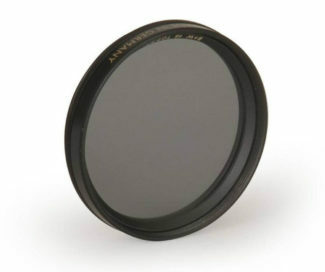 A Polarizing Filter will help control the brightness of the Sun’s image when using a Lunt White Light Wedge visually. Choose either a 1.25″ or 2″ Polarizing Filter, whichever size matches the barrel of your eyepiece. If this product shows “Available on Backorder” and you would like to “get in line” by placing an order with a 10% deposit, send us an email. A member of our staff will contact you with lead times and deposit information. The Lunt 8 x 32 White Light SUNoculars..
With this pocket sized instrument you can view and safely study Eclipses, Planetary Transits, and Sun Spot activity/magnetic storms. Compact, Lunt SUNoculars have a front mounted fully dense white light glass filters making Solar observation 100% safe. These front filters are precision polished to ensure the highest level of viewing quality. The light of the Sun is reduced to a comfortable 1×10-5 transmission and all ultra-violet and infrared components are completely and safely blocked. Lunt SUNoculars are manufactured to the same standards of safety typical to the entire family of Lunt Solar products – the premier manufacturer of Solar telescopes and filters.